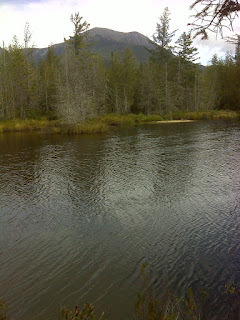 Leaving Millinocket, I headed up to Baxter State Park, intending to take my time to scout around the park a bit. I stopped first at the visitor center at Togue Pond and got some good information, then headed on into the park – the road changes to a narrow dirt road right after the visitor center, and has a 20 mph speed limit and lots of washboard bumps so it was bone-rattling to drive even that fast. I stopped at Katahdin Stream Campground just to scout it out then headed on to Daicey Pond parking area at the AT crossing there, which is just about exactly in the middle of the 5.3 miles of trail that I needed to hike today. With all the slow driving and stops it was not until 9:30 that I was actually hiking. I hiked south first. Almost all of this section followed the roaring Nesowadnehunk Stream. The highlight of this section, and a destination for lots of day hikers, is Big Niagara Falls. 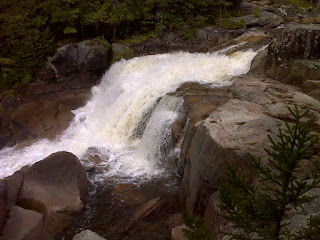 Today it was really gushing after the heavy overnight rains. The upper ford consisted of rock hopping over some fairly deeply submerged rocks. My preferred approach of keeping low and walking the stream bed wasn’t an option here because there was no well-defined bottom, just deep holes between large rocks (as plumbed by my trekking pole). That really scared me because with my high center of gravity and bad balance I didn't want to slip off one of the rock 'stepping stones' and into a deep hole. I had dark visions of twisting an ankle, breaking a leg, getting jammed between unseen deep rocks by the current, unable to pull myself out, etc., etc. On the lower ford, just a mile farther downstream, I was able to walk the stream bed though the water was swift and thigh deep. There I used the ‘hopping rocks’ as hand-holds, passing them on the upstream side so I could use them to bolster me against the current. You get the picture. Between these two fords (each of which I had to do twice, of course), I just walked the trail in my crocs without socks and found no problem except a few bits of trail debris getting in the shoes that I had to knock out. I was back at the Daicey Pond parking area at 12:30 and just picked up a can of Dr. Pepper to drink as I headed on north. This part of the trail was just walking in the woods but with a nice section that follows the north shore of Daicey Pond. And then there's a long reroute, not shown on my 2009 map, which is still the one the ATC sells. The reroute takes you past the south side of Grassy Pond and eliminates the long road walk along the ‘Tote Road’—the main park road. 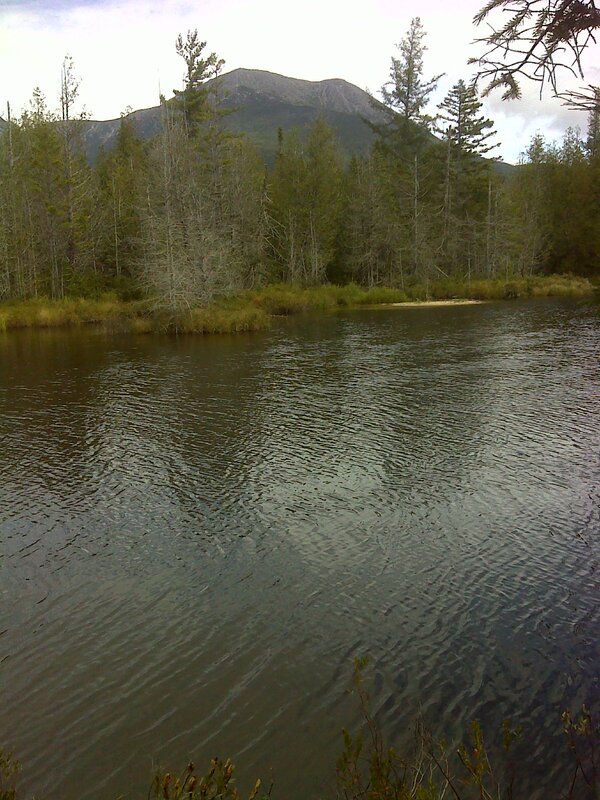 It continues along Katahdin Stream below Grassy Pond and gives you some decent views of the big mountain before finally taking you across the stream on a bunch of new bog bridge. 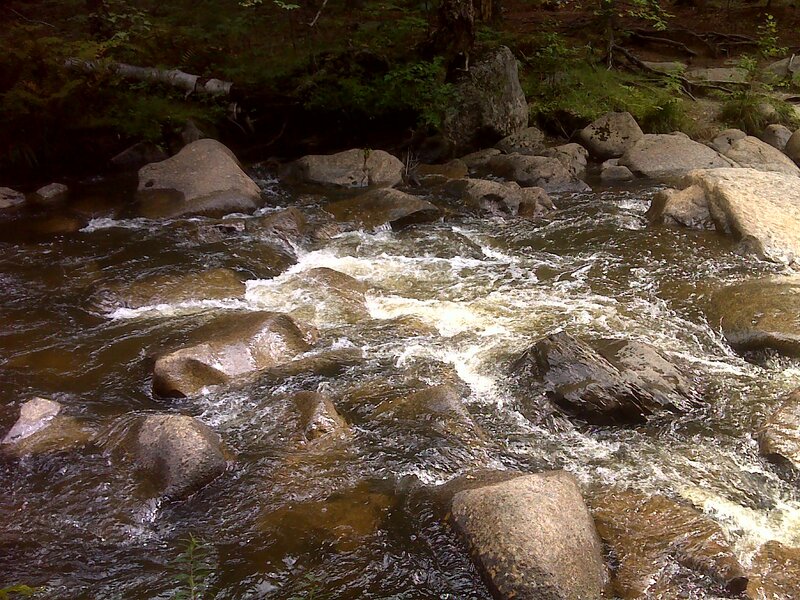 Then there’s a short walk through the woods to where the trail comes out right at the entrance to Katahdin Stream Campground. I took a side trip from there to visit and photograph The Birches – the final shelters along the AT. Then I returned and hiked the short bit of road walk up to the day use parking area at the trailhead. With that finished I visited the Ranger Station, finding that the actual office was closed except from 7 to 8:30AM and 4 to 5PM. But the trail register was there on the screened in porch (where hikers leave their big packs and use one of the available daypacks kept in a bin under the registration table). I spent half an hour paging through the register and photographing all the entries of the dozens of people I’d met along the trail over the past 8 1/2 months. Good to see them all here finishing the trail. I went ahead and wrote my entry so that I wouldn’t have to take time tomorrow to do it – so I could concentrate on doing the hike alone. Finally I hiked back to Daicey Pond, finishing today’s hike at about 3:30.